Launching the New England Wind (NEW) wind monitoring program this morning, left, NEW Technical Director Dr Chris Blanksby, NSW Office of Environment and Heritage officer Lauren Zell, Northern Tablelands MP Adam Marshall, Armidale Dumaresq Council Mayor Laurie Bishop, Project Director Adam Blakester and NEW Chair Barbara Finch. 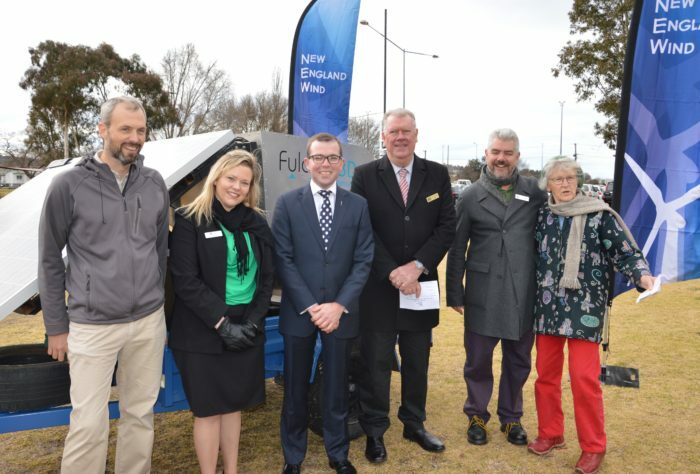 NORTHERN Tablelands MP Adam Marshall today launched an exciting new national wind monitoring program which will see a community wind farm proponent, New England Wind (NEW), collect wind speed data for several possible windfarm sites throughout the high country. Mr Marshall said the year-long project had received $43,000 funding from NSW Government as part of the Office of Environment & Heritage’s Growing Community Energy Program. “This is an exciting project for New England Wind and our region as they will be using, for the first time, a state-of-the-art SODAR (Sonic Detection and Ranging) wind monitoring unit – a trailer mounted device that uses sound, reflected off the atmosphere, to measure wind speed and direction at varying heights up to around 200 metres,” Mr Marshall said. “It’s an affordable and reliable method of wind monitoring which provides sufficiently accurate data for pre-feasibility site assessments. “We will be the first region to make use of the unit and at the beginning of what is likely to be a 10-year program supporting projects right across the country. Mr Marshall said there were enormous environmental benefits for the region with the expansion of the renewables sector and as well as huge economic gains. “With these projects comes millions of dollars of investment, job opportunities and diversification of our local economy so it is vital governments continue to support the development of this project and others,” he said. NEW Technical Director Dr Chris Blanksby said they were very pleased to be the first project in Australia to hire and use a SODAR unit. “NEW is very grateful to have been awarded a grant by the NSW Office of Environment & Heritage to hire the SODAR – we can now gain on-site wind data at an affordable cost and assess the viability of possible sites for our community wind farm,” Dr Blanksby said.